GadgetStation: Amazon's Kindle 2 - Is it an Interesting Gadget? Amazon's Kindle 2 - Is it an Interesting Gadget? Every tech savvy would have heard the news about Amazon's Kindle 2.0 release last week. Let's look into what the entire buzz is about as it is released today. Let's first talk about what is this kindle, in favor of non techies who are the beginners for this niche. "Amazon Kindle is an e-book reader, an embedded system for reading electronic books (e-books), launched in the United States by prominent online bookseller Amazon.com in November 2007. 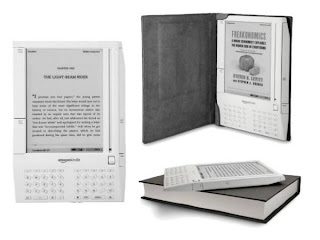 The Kindle was developed by Amazon's Lab126.It uses an electronic paper display and downloads content over Amazon Whisper net using the Sprint EVDO network. The Kindle can be used without a computer, and Whisper net is accessible without any fee." Now I believe that we have an idea about what a kindle mean? Now let us know what this kindle 2 is. The newer version of Kindle 2 is an e-book reader has many improvements over its predecessor. Now let us know about the physical structure of it. It weighs only 10.2 ounces and fits perfectly in your hands. The ergonomics have been improved with change in page-turn button positioning and a new 5-way controller has been added. This device boasts a 25% longer battery life. Kindle is completely wireless and ready to use right out of the box and you can charge it with either wall charger or USB cable. It uses Amazon's Whisper net technology plus Sprint's national high-speed (3G) data network to wirelessly search, discover, and download content on the go and you don't have to pay any wireless bills. Kindle 2 has enhanced library and holds over 1,500 Books, and best of all, a copy of every book you purchased is backed up online at Amazon.com for you to download anytime again if you want to. It also features black-and-white 6″ screen with sharp and natural glare-free display. Has the new Text-to-Speech feature with both male and female voices in case you get lazy to read. Other improvements include 20% faster page turns, annotations to text bookmark your last place in the book, full image zoom, personal documents storage, The New Oxford American Dictionary look up, wireless access to Wikipedia, web search, along with some experimental features like a basic web browser and MP3 and pod cast player. As this kindle 2 is releasing on Feb24th, a lot of business is expected to be done on this kindle 2. In what way? Actually this kindle 2 sells for $400+ in Amazon. Some people who have confirmed shipping resell their Kindle 2s for profit in hopes that Amazon will not be able to satisfy the demand during the launch (as there are much greater expectations on this device).Something like that actually happened with Sony PRS-505 was released. Supply was much lower than demand and for months after the official launch it sold on eBay for double its retail price and the same the kindle2 is also planned. Above all do you think this gadget is worthful at that price? You could just get a net book... either way, as e-books aren't cheap! The screen is too small and it will sell out due to hype with limited production. No touch screen, no wi-fi, they eliminated the SD card slot. Overall a laptop PC is cheaper and many times more versatile. But the fact is that excluding the price of this deal, it's actually a great device, you can browse first chapters of tons of books free, get them delivered wirelessly in seconds, and the new kindles seems to have fixed the navigation and style flaws of the old one and has sped up refresh rate. But the device itself is a nice next step. They can't make it color until eInk perfects the color screen and it's affordable enough to mass produce. Saying things like just buy a laptop complete misses the point of its small size and simplicity, it's supposed to replace a book and disappear in your hand like a book does, not an easy task. Some people don't want to carry around a bunch of books. They don't want the clutter of having a stack of books in their house. This device can store plenty of books and you can access them all at the touch of a button. No need to travel to the bookstore. The battery life on this is touted at days with wireless on and weeks with it turned off. Now that we have discussed about the pros and cons on this topic, the answer lies within it whether it is an interesting device or not. The $359 Kindle 2 is available from Amazon at no extra shipping cost. check out for some more at Truehotdeals.